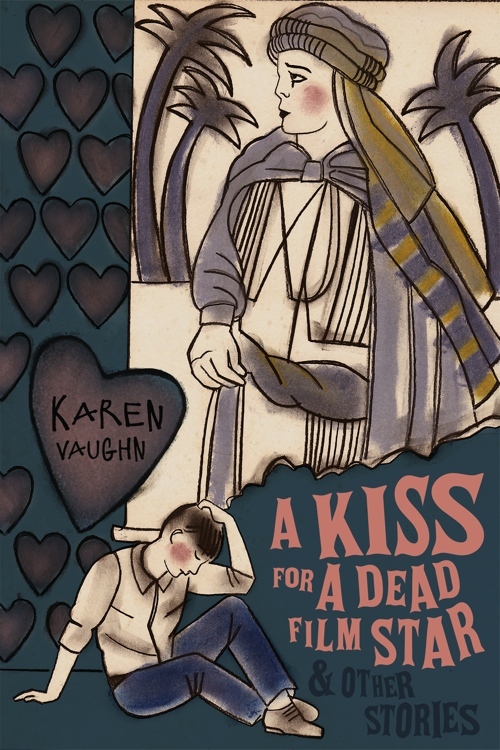 The collection starts with the titular story, ‘A Kiss for a Dead Film Star.’ The protagonist is teenage Isaac Rubenstein, and it is the day that Rudolph Valentino, ‘The Great Lover’ of silent cinema, has died. New York is swept by a wave of grief-stricken fan suicides, and Isaac is determined to be among them. The world splits: in one reality, he succeeds in slitting his wrists, while in another he is interrupted before he can complete the deed and has to spend another day at his job at the movie theater, pining for his best friend Asher, and mock-flirting with Asher’s younger sister Oralee. As his shift ends, it belatedly occurs to him that he can jump off the roof of the building where he works, but he is interrupted again, this time by Oralee who has been possessed of a peculiar feeling—as if she heard his ghost calling for help. This is a slipstream story about possibilities, one that is anchored by the specific possibilities of love and hope in a world that tends to insist that love and hope are things that should be denied to queer people. It is thoughtful and beautiful and stand-out. The second story, however, ‘Still Life with Fossils,’ may well be my favorite. It concerns the bewildered point of view of a tyrannosaurus rex skeleton in a museum, trying to make sense of the small, odd creatures that carry boxes and occasionally flash lights. His only companion is the slightly more wiser, neighboring skeleton of a herbivore, who speculates that these must be the newly dominant lifeforms of their world. In this peculiar afterlife, they have only each other, until one day she is gone, replaced by the silent skeleton of a Triceratops. And so the Tyrannosaur waits, as his friend once did, for the new arrival to come to consciousness as well. There’s something bittersweet about the notion of change even in the afterlife, and as I’ve always been an enthusiast about visiting dinosaur bones in any museum that happens to have them, I very much enjoyed this take. ‘The Piscine Age’ and ‘The Angel Appearing to Corrine’ both flirt with something like magical realism. ‘The Piscine Age’ concerns a married couple whose lives are challenged when one of them develops a mysterious skin condition—a condition that consists of developing scales below the waist and, slowly, the fusion of legs into a tale. The process is incurable and painful, and they tearfully agree that this has to end. I was preparing myself for a messy, ableist conclusion, but thankfully Vaughn sidesteps expectations and has the character retreat to the sea instead. ‘The Angel Appearing to Corrine,’ in contrast, has one of the most uniquely happy endings I’ve seen in ages. Corrine immaculately conceives a child of sound waves, despite her doctor’s insistence that she’s really bearing a tumor; she gives birth to brilliant, redeeming song. This is the sort of story for anyone who has heard a particular piece of music and been struck dumb by its beauty; we talk a lot about the redemptive power of art, but here the metaphor is made literal, and it really works as a piece of fiction. ‘Limbs’ is an evocative story about migrant workers in the US, and it too has elements of magical realism to it. Marquita is a small child with a gift; much like a starfish, her limbs can be removed, and then grown back. This is a gift that she has to hide, but again, she’s a small child; sometimes things just happen. One afternoon a playmate dares her to do something stupid, she does, and it sets in motion an ugly chain of events that ultimately cost her family, their home. The story is told through the perspective of her mother, Alejandra, who has hidden the same secret as her daughter for most of her life, and the events take place during one long, hot afternoon, in which emotions of fear, hate, hope, anger, and fear again play out across their community. This story too offers the possibility of hope, but at a dark remove, with the future left in doubt. The final story, ‘Edna, Filled with Light,’ is also concerned with an uncertain future, one that grapples with the end, both in terms of human and terrestrial mortality. Edna is an elderly scientist who has been fascinated by meteors and meteorites all her life. On what may be her last day on Earth, the world is bombarded by increasing numbers of meteorites as she relives her memories: as a young girl fascinated by science and movie stars, as a young woman embarking on a love affair, caught in a world-changing car accident and then a hospital stay, another love affair just as important as her marriage, and a lifetime devoted to her calling. Sic transit gloria mundi, whether in the individual or the infinite. The weight of these stories is much heavier than this slight volume should allow, and each of them packs an emotional punch. They are also compellingly readable. I tried to ration myself to one a day and failed; I had to go back and reread to make sure that each one got the attention it deserves. While enjoyable, they are not easy stories, as there is a wealth of description and emotion in each piece. Each story also feeds into the next in a way that is thematic and tells a journey of its own; this is a very different reading experience than many short story collections, which are almost haphazard in how they present various tales back-to-back. This isn’t a light read, but it’s a great one, and I highly recommend this collection to anyone looking for a thoughtful way to end their summer.